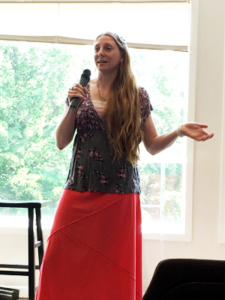 Last Tuesday morning, in the very classroom where she sat as a resident 10 years ago, 2006 Mercy graduate Tina shared her story of transformation with the Nashville Mercy residents. Tina shared how she had attended church regularly during her childhood and was involved in Bible studies, but the lack of communication in her family caused her to strive to be perfect. She remembers struggling with perfectionism until she was 16 years old. That’s when her family moved to a different state, and she stopped caring. She didn’t care about God anymore and didn’t think He cared about her either. She instead turned to an unhealthy relationship with a guy who was heavily involved in drugs. Soon, she started using drugs and eventually became addicted to cocaine. She developed anorexia and bulimia and suffered from anxiety and depression. After her high school graduation, she hit rock bottom and overdosed on sleeping pills. In the first month at Mercy, Tina said something changed within her. She saw the joy, freedom, and hope in the other girls attending the program – girls who had gone through similar things as her. She couldn’t deny it was God working within them. Her heart changed, and with the help of her Mercy counselor and other staff members, she was able to sort through all of the underlying issues of why she had chosen to do drugs. She discovered God’s unconditional love. She realized her security and hope is in Christ. She learned how to battle lies she believed and replace them with God’s truth. And He has. 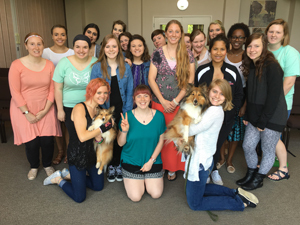 After graduating from Mercy, Tina shared that she served on two different mission trips, one to Brazil and one to Haiti, and also went on to get her Master’s degree in Marriage and Family Therapy. “When I was at Mercy, God planted a seed and a passion in my heart that I was going to help teenage girls and young women that were struggling like I was.” She now works at a wilderness therapy camp, counseling at-risk teenage girls. “I feel so blessed and honored to be on the other side, giving back,” she said. Mercy celebrates all that God has done and will continue to do in and through Tina’s life! For more stories of transformation, visit our Success Stories web page.